The addition of the ergosphere in rotating black holes provided a way to extract energy from it. The Penrose process is such a mechanism. Piran et al. found that this mechanism also works for two colliding particles, in such, the efficiency (η) of these collisions can be analytically and numerically determined. In this paper, we will be interested in the Kerr-Newman spacetime, a rotating charged black hole. We are interested in the effect of the charge (Q) to the efficiency of collisional Penrose process. We will only investigate a specific case, two neutral particles colliding that produces two photons. We have found that the charge mainly suppresses the efficiency. Also, because of the charge of the black hole, the ergosphere reduces, and that for Q = p 2/3M, the efficiency will be less than 1. J. A. Baybay and M. F. I. Vega. 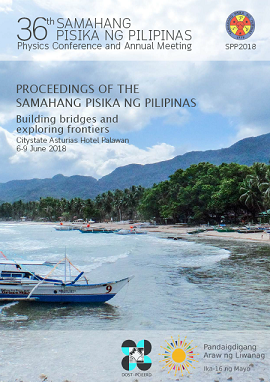 Efficiency of collisional Penrose processes in charged black holes, Proceedings of the Samahang Pisika ng Pilipinas 36, SPP-2018-PB-31 (2018). URL: https://paperview.spp-online.org/proceedings/article/view/SPP-2018-PB-31.